Earn $2.88 in VIP credit (288 points)What's This? Resin pads are much quieter than Metal pads. Metal pads have longer life and better all-weather performance. This set features titanium plates to lighten the load. Replaces the pads on ONE caliper. Replaced a set of worn out pads and couldn't be happier. They were very easy to install and seated very quickly. 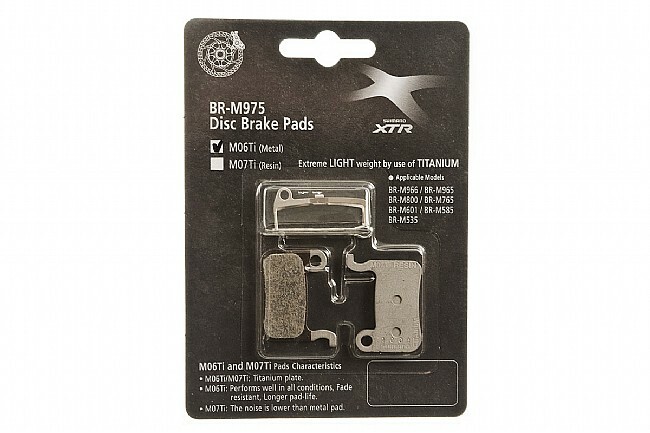 I would recommend these to anyone with the older style XTR brakes. I'm glad to see Biketiresdirect.com still stocks them.